During the 1960s and 70s, more bombs were dropped on a landlocked part of Southeast Asia than in any other war – and it wasn’t Vietnam. The turbulent history of the Land of a Thousand Elephants, the Kingdom of Laos, is the backdrop for this family saga, told as a historical novel. THE OPPOSITE OF HATE opens a window onto a forgotten corner of Southeast Asia and brings little known history to life through vivid characters and settings which explore the cultural heritage of Lao history. 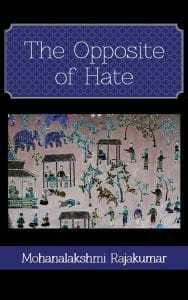 THE OPPOSITE OF HATE explores the intersections of family, loyalty, and nationalism as Vientiane, the capital of Laos, is being taken over by Communists. The political instability drives Seng, a widowed engineer, to marry his best friend’s teenage daughter, Neela, so they can escape re-education or even worse, death. The unlikely husband and wife cross the Mekong River into Thailand as strangers. Life in the refugee camp brings surprises along with the grime. As they struggle for survival, romances blossoms into an unplanned pregnancy. Seng and Neela get their wish of immigrating to the United States. Succeeding in suburbia, however, presents another unique set of challenges, ones that are not black and white. This is a tale of intermingled violence, love and ambition. Seng and Neela embody the historic cultural struggle of thousands who fled the threats of communism only to face the challenges of democracy.